Scones make an ideal companion to a morning cup of coffee or tea. 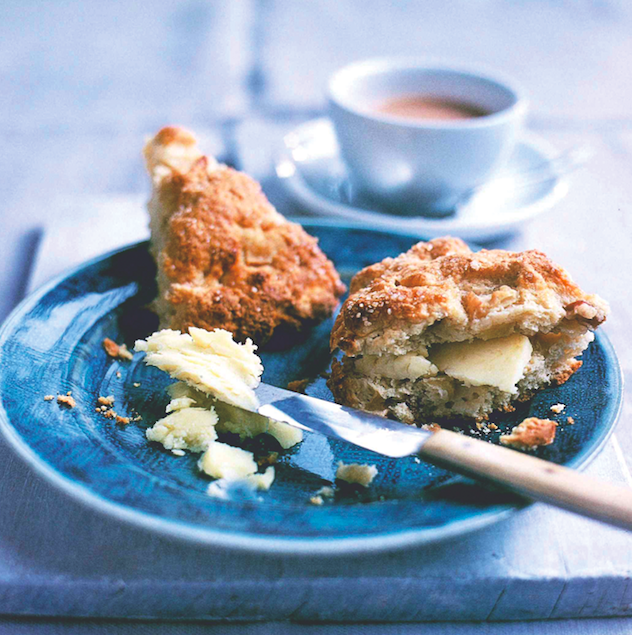 Simple and delicious, this recipe for “Maple Pecan Scones” from Linda Collister’s “Quick Breads” (Ryland, Peters & Small) is ideal for scone lovers who want something quick to make in the morning. Sift the flour, baking powder and salt into a large bowl. Add the butter and rub it in with the tips of your fingers until the mixture resembles fine crumbs. Mix in the pecans. In a separate bowl, beat the egg with maple syrup and 1 tablespoon of the milk. Stir into the flour mixture with a round-bladed knife to make a soft, coarse-looking dough. If the dough is dry and crumbly and won’t stick together, stir in more milk 1 tablespoon at a time. If the dough is very wet and sticky, work in another tablespoon of flour. Tip out the dough onto a work surface lightly dusted with flour and gently work it with your hands for a few seconds so it looks smoother. Put the dough ball onto the prepared baking sheet. Dip your fingers in flour and pat out the dough to a round about 11/4 inches thick and 7 inches across. Using a knife, cut the round into 6 wedges, but do not separate the dough before baking. Bake for 18 to 20 minutes until light golden brown. Transfer to a wire rack and leave until the wedges are cool enough to separate. Serve warm the same day. The cooled scones can be wrapped tightly and frozen for up to 1 month.